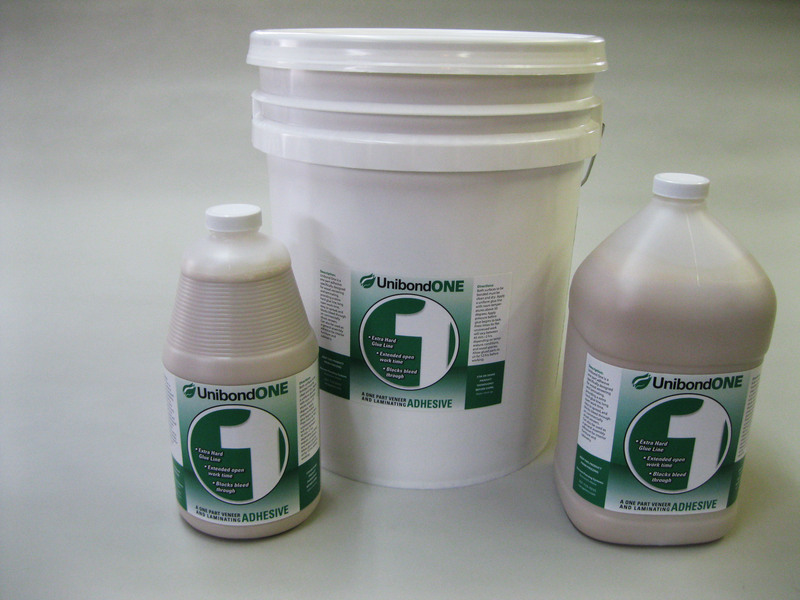 Although not as high a performer as our two part Unibond 800, Unibond One is an excellent veneering and laminating adhesive when the extreme rigidity and performance of a two part urea resin glue is not required. Veneering flat and curved parts. Laminating curved panels and bent laminations. Assembly glue for furniture, cabinets, and general joinery. Neutral tan color – Suitable for lighter and medium tone woods. White and dark brown tints are availible for extremely blond woods as well as extra dark ones – One 8 oz. bottle of tint will color a full 5 gallon pail at full strength. Longer open work time – extended open time required for most panel work. Eliminates bleed through – Will stop bleed through on most unbacked commercially sliced veneer.